A convenient all-in-one filing kit. Complete with 25, 9.5 pt. Manila folders with 1/3 cut tabs and 25, 11 pt. standard green hanging file folders with 1/5 cut tabs. A convenient all-in-one filing kit that's environmentally friendly. Complete with 25, 11 pt. 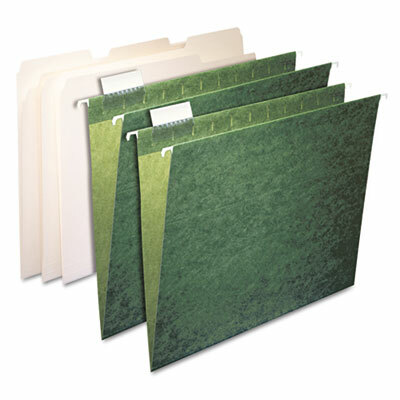 standard green hanging file folders with 1/5 cut tabs and 25, 9.5 pt. Manila folders with 1/3 cut tabs for categorization within hanging folders. Everything you need to set up an efficient filing system.